The Toffees have been without a manager since parting ways with Sam Allardyce, who was sacked by the club earlier this month after less than six months in charge at Goodison Park. Silva has signed a three-year contract at Everton - his third English club following spells at Hull City and Watford. "I'm really proud to be the new Everton manager," said Silva, who will hold his first press conference on Monday. "I want to express my thanks to Farhad [Moshiri], to the Chairman, to the Board of Directors and to Marcel [Brands] as well for the confidence in my work. Silva was originally a candidate for the Everton job after Ronald Koeman was sacked in October. However the club were forced to back off after Watford accused them of tapping up their manager. The Hornets have since made an official complaint to the Premier League over the approach and a mediation meeting held between the two clubs in April failed to resolve the issue. The Premier League may be forced to convene a commission to find a suitable conclusion to the row, which could end with Everton paying a suitable compensation figure to Watford. Silva becomes the second high-profile arrival at Goodison Park this month, following the recent appointment of new director of football Marcel Brands. "Marco is a young coach but also an experienced coach and he's worked already at the top, while also gaining experience of the Premier League which is also an important factor," Brands added. "One of the most important things is that he's a guy who wants to play attractive, attacking football and also wants to work in the structure we have at Everton. "He's a guy who has proved already that he wants to work with young players, make them better and he has performed very well with the teams he's worked with. He will be a very good manager for Everton." Everton chairman Bill Kenwright believes Silva, Brands and Moshiri can collectively guide the club to silverware. 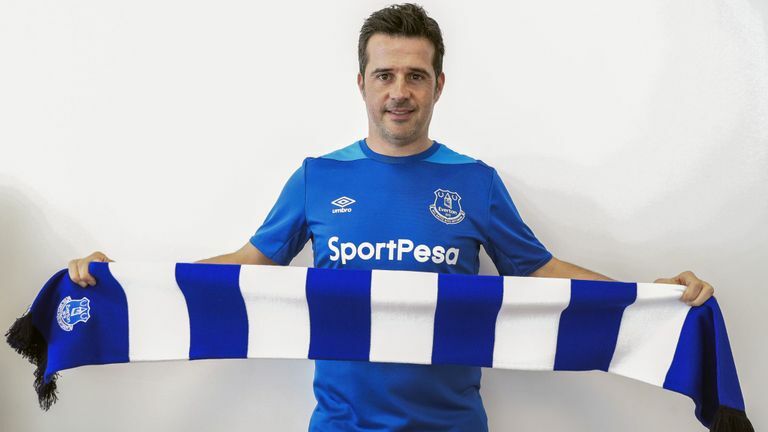 Marcel Brands is relishing the chance to work with Silva "It is a pleasure to welcome Marco Silva as our new manager," said Kenwright. "As the posters outside Goodison have proclaimed for many years, DNA is important to Everton and Evertonians. "It's what they instinctively search out. In Marco and Marcel we welcome a pair of sportsmen whose statements of intent have already shown that they embrace that special quality that Evertonians look for. "And with Farhad's vigorous patronage we are looking forward to the three M's, Marco Marcel and Moshiri, help take the Blues back to their rightful position among football's elite."